A full interacitve map showing locations of Fright Fest entertainment, haunted houses, and scare zones. Past and present image galleries and videos related to Fright Fest at Six Flags Fiesta Texas. Six Flags Fiesta Texas provides a great line-up of live entertainment during Fright Fest. All of these shows are FREE with admission. DIAMOND/DIAMOND ELITE MEMBERS: Visit the "Helpful Tips & More" tab at the top of the page to learn more about your Fright Fest perks. House of Bones, BRAND NEW for Fright Fest 2018, makes its way to Fiesta Texas. The cast features a voodoo master, gypsy queen, and their band that sing spooky songs guaranteed to get you into the Halloween spirit. Rock Apocalypse, a true guest-favorite, returns for 2018 and is the perfect experience for those who enjoy all the classic rock hits. A live band and singers fill out this production. Younger guests have the ability to enjoy less frightening activities during the day time. Join your favorite Looney Tunes characters in Kidzopolis during the day for an excursion to collect candy and other goodies along the "Twick or Tweat Trail." Haunted Houses are FREE with park admission. If you are looking to avoid the long lines during your visit, the park does offer upgraded packages. These upgraded options are listed below. VIP house entry wristband for one Fright Fest visit. VIP house entry wristband for all Fright Fest visits. These are designated areas around the park in which monsters roam with one goal in mind: to scare you. During the day, these areas are safe to walk through for guests of all ages. However, once the sun begins to set Scare Zones come to life. Important tips and information to help you get the most out of your visit to Fright Fest. Diamond Elite members receive a VIP Express Pass EACH visit for haunted houses (pick up at Member Services). Diamond members receive a VIP Express Pass ONE visit for haunted houses (pick up at Member Services). VIP entry and seating will be available for both membership levels at live shows. The park's new haunted house, Midnight Museum of the Macabre, is open from 6pm to 7pm exclusively for Diamond and Diamond Elite members only. PLEASE NOTE: Discounts are NOT available on haunted house passes during Fright Fest. Six Flags Fiesta Texas will still provide a family-friendly atmosphere during the daytime hours of operation. However, once the sun sets, the atmosphere will change to a more frightening setting. The nighttime event is recommended for guests older than 12. The park does offer daytime activities that are friendly for younger guests. We will be providing information for this in the "Entertainment" tab above. 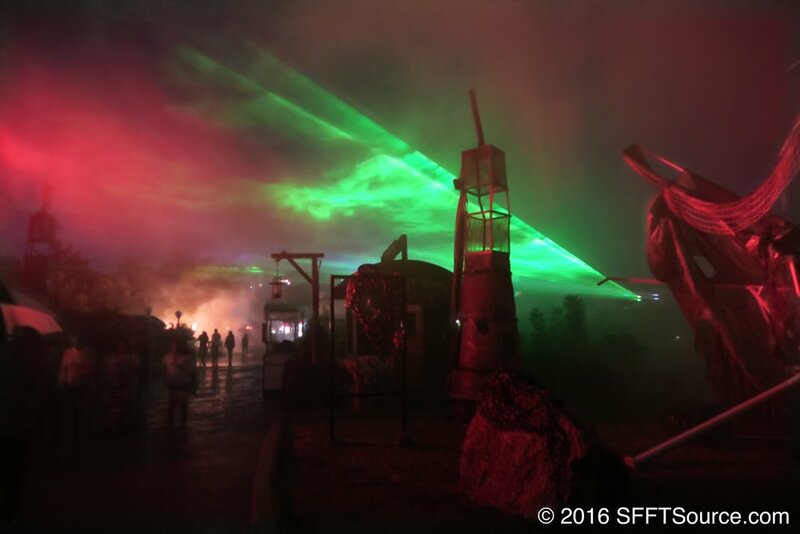 Fiesta Texas provides a handful of great entertainment during Fright Fest. One can't-miss show is Monster Mash Bash. This show takes place at the end of each night in Lone Star Lil's Amphitheater. We recommend that you arrive to shows early as they are quite popular during this time of season and seating is limited. More information regarding shows can be found using the Entertainment tab at the top of the page. A great aspect of Fright Fest is that all haunted houses are free with park admission. With free haunted houses comes longer lines, however. We recommend looking into one of the upgraded haunted house packages once at the park as it will make your visit more enjoyable and you will not spend your whole evening waiting in line. Pricing for upgraded packages can be found in the "Haunted Houses" tab above. Please note that the park typically offers these passes at a discount if you purchase on their main website. Go earlier in the season. Fright Fest starts in September. You will likely not run into the heavy crowds that are present the closer it gets to Halloween. Go on an off-day. Have you thought about going to Fright Fest during the week on a Friday? This has sometimes been a great way to avoid the weekend crowd. Do not go on coupon dates. If there is a deal for bringing friends free or discounted tickets we highly recommend that you do not go to the park if you are bothered by large crowds. Try going on a Sunday. This isn't always the case, but sometimes Sunday is a less-crowded day than Saturday. We still think the closer it gets to Halloween the busier Sundays will inevitably get. Fiesta Texas offers a number of specialty food and drink options during Fright Fest. All of these options are also available as meals and snacks on the Dining Pass. Click the button below for a full run-down of these specialty options for Fright Fest 2018. Fiesta Texas has added a handful of scare zones over recent years. While it is perfectly okay to walk through these during the day they will transform into a different world at night. Scare zones are full of characters with the sole purpose of scaring guests around them. Please keep in mind that many of these areas are unavoidable when trying to reach certain park attractions at night. When is the park open for Fright Fest? Fright Fest operates on select dates between September 14th and October 31st for the 2018 season. For a calendar of the Fright Fest operating schedule please go to the "Essentials" tab in the navigation near the top. Six Flags Fiesta Texas does close some rides and attractions at certain times during Fright Fest. These usually include smaller children's attractions. We recommend checking out our page that lists all rides and attractions at the park. If a ride closes at a certain time or is closed for the whole event it will be listed on each ride's dedicated page.